Here are the most important news items we have published in 2008 on PHP.net. Due to unfortunate circumstances Windows binaries for PECL extensions will no longer be available on http://pecl4win.php.net. If anyone is interested in the project please join the PHP Windows Development mailinglist. The PHP Development Team would like to announce the immediate availability of PHP 5.2.8. This release addresses a regression introduced by 5.2.7 in regard to the magic_quotes functionality, which was broken by an incorrect fix to the filter extension. All users who have upgraded to 5.2.7 are encouraged to upgrade to this release. Alternatively you can apply a work-around for the bug by changing "filter.default_flags=0" in php.ini. Due to a security bug found in the PHP 5.2.7 release, it has been removed from distribution. The bug affects configurations where magic_quotes_gpc is enabled, because it remains off even when set to on. In the meantime, use PHP 5.2.6 until PHP 5.2.8 is later released. The PHP development team would like to announce the immediate availability of PHP 5.2.7. This release focuses on improving the stability of the PHP 5.2.x branch with over 120 bug fixes, several of which are security related. All users of PHP are encouraged to upgrade to this release. Fixed missing initialization of BG(page_uid) and BG(page_gid), reported by Maksymilian Arciemowicz. Fixed incorrect php_value order for Apache configuration, reported by Maksymilian Arciemowicz. Fixed a crash inside gd with invalid fonts (Fixes CVE-2008-3658). Fixed a possible overflow inside memnstr (Fixes CVE-2008-3659). Fixed security issues detailed in CVE-2008-2665 and CVE-2008-2666. Fixed extraction of zip files and directories with crafted entries, reported by Stefan Esser. Further details about the PHP 5.2.7 release can be found in the release announcement for 5.2.7, the full list of changes is available in the ChangeLog for PHP 5. The PHP development team is proud to announce the third alpha release of the upcoming PHP 5.3.0 minor version update of PHP. Several new features have already been documented in the official documentation, others are listed on the wiki in preparation of getting documented. It is imperative that more people join the effort to complete the documentation for PHP 5.3.0. Please also review the NEWS file. The purpose of this alpha release is to encourage users to not only actively participate in identifying bugs, but also in ensuring that all new features or necessary backwards compatibility breaks are noted in the documentation. Please report any findings to the QA mailinglist or the bug tracker. Several under the hood changes also require in depth testing with existing applications to ensure that any backwards compatibility breaks are minimized. The current release plan expects a stable release sometime around the end of Q1 2009. December is a busy and exciting time of the year. PHP Advent is an attempt to capture and share doses of wisdom from a few of the people in the PHP community who have been kind enough to share their thoughts and tips. Please join us on our daily journey by subscribing to our feed or following us on Twitter. Happy holidays. The 2008 edition of the French PHP users welcomes once again unique speakers : Zak Greant, from Foo Associates, Laura Thompson from Mozilla, and Lukas Smith, Core PHP Developper. Set in Paris, on December 8th and 9th 2008, by the Association Française des Utilisateurs de PHP (French PHP User Group, http://www.afup.org/), the Forum PHP 2008 focuses on the themas of Professional Web Services, and PHP large scale projects. PHP North West are pleased to announce their first conference, PHPNW08, to be held at Manchester Central (formerly GMex). On Saturday 22nd November 2008, PHPNW08 will bring together the North-of-England PHP community for a one-day event of exceptional presentations, challenging workshops, sensational debates and networking opportunities. The conference will host a mixture of well-known regulars on the speakers' circuit and local talent, and aims to highlight current best practices and emerging topics within the sphere of PHP and web development. See our conference schedule for details. Tickets for PHPNW08 are on sale now at http://conference.phpnw.org.uk/phpnw08/register/. PHP Québec is pleased to announce the seventh edition of the PHP Québec Conference. The Conference will take place in Montréal, Québec, Canada between March 4 and 6th 2009. We are looking for speakers willing to share their expertise with Canadian and United States PHP professionals. The Conference features technical talks and Labs dedicated to advanced software development techniques with PHP5 and PHP6, XML, web services,databases, etc., project management where speakers and visitor swill try to find solutions to actual business problems. The PHP Barcelona User Group is proud to announce its first international PHP Conference. It will be celebrated on Saturday, September 27th, at Barcelona. The PHP Barcelona User Group (aka PHPBarcelona) is a non-profit organization aimed at spreading and interchanging knowledge among the PHP developers community of Barcelona and surroundings, and also evangelizing the PHP technology on universities and enterprises as well. This year they had celebrated another events but this one is the first which will be developed completely in English. The highlights of this conference will be the talks of internationally recognized PHP developers, like Derick Rethans and Scott MacVicar among others. The premiere PHP Conference – Celebrate the 14th event with us! Today the ICP is the reference whenever substructures of existing technologies should be extended or the basis for new developments should be created. Thus, you do not only profit from the concentrated know-how of worldwide acknowledged, international PHP-experts but also from the professional transfer of knowledge between industry and development. With its mixture of topics the International PHP Conference provides an ideal resource for all professionals and their successful daily routine within the whole PHP-spectrum. Insights into current Web 2.0 technologies, Security, Best Practices for tools and components, Enterprise know-how, databases, architectures and more are provided at the ICP 2008. The International PHP Conference celebrates it's 14th Edition. Celebrate with us, and profit from our Celebrate 14teen offers! Offer is valid till 30th September! The publishers of php|architect Magazine and Python Magazine are proud to announce the joint php|works / PyWorks 2008 conferences in Atlanta, Georgia, USA. php|works and PyWorks feature over 65 talks, 10 tutorials and 5 tracks on topics ranging from web development to database optimization with PHP and Python over the course of two days, social events in the evening and plenty of networking opportunities with industry peers. This year, the PHP Community (and the Python Community, too!) meets November 12-14 for one of North America's premier PHP conferences of 2008. Join us to hear top speakers such as Derick Rethans (eZ Systems), Chris Shiflett (OmniTI), Mike Potter (Adobe) and more. The PHP development team would like to announce the immediate availability of PHP 4.4.9. It continues to improve the security and the stability of the 4.4 branch and all users are strongly encouraged to upgrade to it as soon as possible. This release wraps up all the outstanding patches for the PHP 4.4 series, and is therefore the last PHP 4.4 release. Updated PCRE to version 7.7. Fixed crash in imageloadfont when an invalid font is given. Fixed open_basedir handling issue in the curl extension. Fixed mbstring.func_overload set in .htaccess becomes global. For a full list of changes in PHP 4.4.9, see the ChangeLog. The PHP development team is proud to announce the first alpha release of the upcoming minor version update of PHP. Windows binaries will be available starting with alpha2 (intermediate snapshots available at snaps.php.net). The new version PHP 5.3 is expected to improve stability and performance as well as add new language syntax and extensions. Several new features have already been documented in the official documentation, others are listed on the wiki in preparation of getting documented. Please also review the NEWS file. New syntax features like NOWDOC, limited GOTO, ternary short cut "? :"
Several under the hood changes also require in depth testing with existing applications to ensure that any backwards compatibility breaks are minimized. This is especially important for users that require the undocumented Zend engine multibyte support. The current release plan states that there will be alpha/beta/RC releases in 2-3 week intervals with an expected stable release of PHP 5.3 between mid September and mid October of 2008. Overall 158 tests have been submitted as part of TestFest 2008 since the launch of the TestFest submission site by 30 different people from people all over the world. Actually this is not counting the various submissions by existing core developers, who also took this opportunity to add some more tests. This has actually increased total test coverage for ext/reflection, ext/dom and ext/exif by about 10% each. While the organization of the TestFest was a bit adhoc, there were numerous TestFest events in local user groups. So the number of people exposed to the PHP test framework is much greater. Hopefully this will lead to more people submitting bug reports with an accompanying phpt test file! Our top submitter Felix De Vliegher has actually committed his last submissions himself since, based on the high quality of his submissions, he has been granted commit rights to the PHP repository. We have not heard back from all participants, but we encourage everybody to blog about their experience and provide us with feedback on how to improve future events. Now better late than never, here are the 10 winners of the promised elePHPant raffle sponsored by Nexen. Note that Felix asked me not to include him in the raffle, since he is already herding quite a number of elePHPants at home. We will provide Nexen with the email addresses of the winners, so that they can arrange to get the elePHPants shipped. Also for those people wondering, you can continue to submit tests on the TestFest submission site. A bit thank you to all participants and TestFest organizers! Without the countless people that helped organize local events, implement the infrastructure and submissions reviewers, the TestFest would have obviously not worked out as well as it has. We will surely do similar events in the future based on the big success of TestFest 2008. A few weeks ago the manual was restructured to improve navigation and make room for per-extension chapters and usage examples along with improved documentation for object oriented extensions. The most noticable changes are the function reference, predefined variables, context options and parameters and predefined exceptions manual pages, for which we would really appreciate feedback on. The upcomming PHP5.3 release introduces several major features such as namespaces, closures, late static bindings, internationalization functions, INI sections, and Phar among others. We would really appreciate any and all help we can get improving the documentation. In related news, the manual was relicensed recently and is now covered by the CreativeCommons Attribution license. The elePHPants are now ready to make their 2008 generation. PHP User groups, enthusiasts and companies that are interested in groups of elePHPants, shall join this year's herd. ElePHPants are a great link of the community, happily promoting your favorite language in conferences, on work station, baby cribs and other unusual places. Production prices make it possible for groups to raise funds, entice membership or simply bring joy and PHP around. Pre-register your herd of elePHPants online, for big and small, and join the world of blue elePHPants. Update (May 11th): Unfortunately Nicholas Sloan had to drop out of the program, but he will be replaced by Rudy Nappée working on the same application. The PHP development team would like to announce the immediateavailability of PHP 5.2.6. This release focuses on improving the stability ofthe PHP 5.2.x branch with over 120 bug fixes, several of which are security related.All users of PHP are encouraged to upgrade to this release. Further details about the PHP 5.2.6 release can be found in the release announcement for 5.2.6, the full list of changes is available in the ChangeLog for PHP 5. Fixed possible stack buffer overflow in the FastCGI SAPI identified by Andrei Nigmatulin. Fixed integer overflow in printf() identified by Maksymilian Aciemowicz. Fixed security issue detailed in CVE-2008-0599 identified by Ryan Permeh. Fixed a safe_mode bypass in cURL identified by Maksymilian Arciemowicz. Properly address incomplete multibyte chars inside escapeshellcmd() identified by Stefan Esser. Update (May 6th): The Windows installers were missing the XSL and IMAP extensions. Update (May 3rd): The Windows archives were missing the XSL and IMAP extensions. 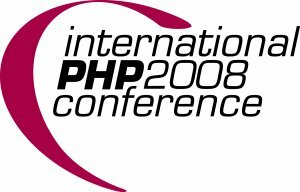 The AFUP, Association Française des Utilisateurs de PHP, is proud to announce the upcoming conference "Forum PHP 2008". For this unique event in France, we are looking for the best French speaking experts, who want to share their know-how and enthusiasm. This two day conference features one technical day, with the most advanced PHP techniques and a business day, with case studies and examples of successful projects. Sessions will typically be 45 minutes long followed by a 10 minutes Q&A session and up to 3 hours for workshops. Use the form on the site, no email proposal will be accepted. Proposals will be reviewed after the deadline has passed. Additional information may be asked where needed. Proposals will be chosen according to their layout, relevancy for a professional audience and the overall homegeneity of the forum. Every candidate will be personnally notified of the status of their proposal. The decision is final. Priority will be given to sessions in French. The DC PHP Developers Group recently announced Kshemendra Paul as a featured keynote speaker at the DC PHP Conference & Expo, June 2-4, 2008, at George Washington University in Washington, DC. Paul, chief architect for the Office of Management and Budget Executive Office of the President, will be presenting on "Federal E-Government and Enterprise Architecture Updates." Join hundreds of PHP practitioners, business managers, and government officials from around the world in the exchange of ideas and solutions for building a better web application infrastructure. The DC PHP conference will include tracks pertaining to business cases, best practices, the art of PHP, PHP applications, PHP in the enterprise, and Open Source. The full speaker schedule will be announced shortly. The PHP-QA team would like to announce the TestFest for the month of May 2008. The TestFest is an event that aims at improving the code coverage of the test suite for the PHP language itself. As part of this event, local User Groups (UG) are invited to join the TestFest. These UGs can meet physically or come together virtually. The point however is that people network to learn together. Aside from being an opportunity for all of you to make friends with like minded people in your (virtual) community, it also will hopefully reduce the work load for the PHP.net mentors. All it takes is someone to organize a UG to spearhead the event and to get others involved in writing phpt tests. The submissions will then be reviewed by members of php.net before getting included in the official test suite. Please visit the TestFest homepage to get additional details on the TestFest on how to get involved, either as a UG or by setting up the necessary infrastructure. Once again we are glad to announce that we have been accepted to be a Google Summer of Code project. See our program for this year's GSoC. We would like to take this opportunity to say thanks to Google Inc. for this privilege to participate once again, and would like to invite everyone to look at our list of ideas: http://wiki.php.net/gsoc/2008. Students are of course more than welcome to come up with their own ideas for their proposals and we will consider each and every application that we will receive. So once again, thanks to everyone who is involved in this magnificent journey and we hope to see many of you great students and open source passionate join us in our most enjoyable Google Summer of Code projects. The publishers of php|architect Magazine are proud to announce the php|tek 2008 conference in Chicago, Illinois, USA. The PHP Community meets May 20-23 for one of North America's premier PHP conferences of 2008. Join us to hear top speakers such as Derick Rethans (eZ Systems), Lucas Nelan (Facebook), Chris Shiflett (OmniTI), Eli White (Digg) and yes, even Terry Chay (Tagged). For the past two years, php|architect's spring conference has sold out weeks before the start date, so if you're interested in attending, don't delay, and be sure to sign up ASAP! The PHP Quebec team is pleased to present the sixth edition of the PHP Quebec Conference. The Conference will take place in Montreal, Canada, on March 12 through 14. Join us for the PHPLabs, 2 days of technical talks, the Open Source Job Fair & Cocktail. Meet with well know community members such as: John Coggeshall, Marcus Boerger, Zak Greant, Chris Shiflett, Damien Seguy and many more. February 29th (Leap Year Day). phplondon.org announce their third annual community conference to be held at Inmarsat, Old Street, London. This year the conference will run two tracks and include speakers such as Derick Rethans, Wez Furlong, Scott MacVicar and Zoe Slattery. We will also be holding an extended presentation and discussion on frameworks for PHP. Visit our conference site to register. Early bird discount is available until 1st February 2008. The PHP development team would like to announce the immediate availability of PHP 4.4.8. It continues to improve the security and the stability of the 4.4 branch and all users are strongly encouraged to upgrade to it as soon as possible. This release wraps up all the outstanding patches for the PHP 4.4 series, and is therefore the last normal PHP 4.4 release. If necessary, releases to address security issues could be made until 2008-08-08. Fixed an integer overflow inside chunk_split(). Identified by Gerhard Wagner. Fixed integer overlow in str[c]spn(). Fixed regression in glob when open_basedir is on introduced by #41655 fix. Fixed money_format() not to accept multiple %i or %n tokens. Added "max_input_nesting_level" php.ini option to limit nesting level of input variables. Fix for MOPB-03-2007. Fixed INFILE LOCAL option handling with MySQL - now not allowed when open_basedir or safe_mode is active. Fixed session.save_path and error_log values to be checked against open_basedir and safe_mode (CVE-2007-3378). For a full list of changes in PHP 4.4.8, see the ChangeLog.